There's also going to be a seminar which can also be attended by those visiting the show. Both events are ticketed. PS My blog post reviewing Heat 7 of the Sky Portrait Artist of the Year will now be published tomorrow. Definitely - I'm not going anywhere - it's snowing!! Posted by Making A Mark on Wednesday, February 28, 2018 0 comments Who's linking to this post? Once in a while, a really significant collection of art and artifacts rolls into town - and it's possible to see the works on exhibition prior to a grand auction - and bid on them if you feel so inclined! The auction sale will take place in the Spring (dates to be announced) at 20 Rockefella Plaza in New York. 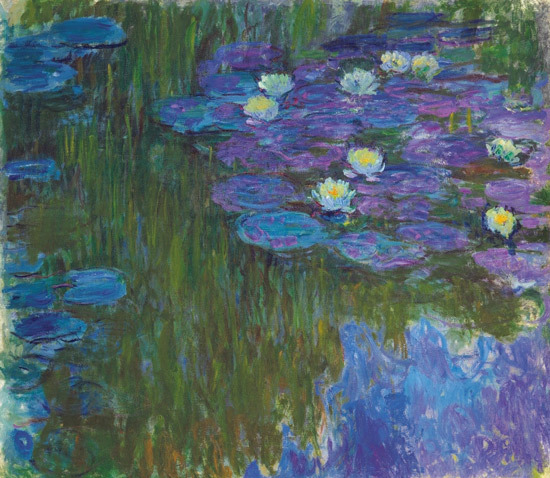 It's expected that the sale will offer 1500 works overall split across auctions taking place in New York during the week of May 7. Below you can see the images in different contexts and learn something of how they were acquired. Posted by Making A Mark on Monday, February 26, 2018 0 comments Who's linking to this post? 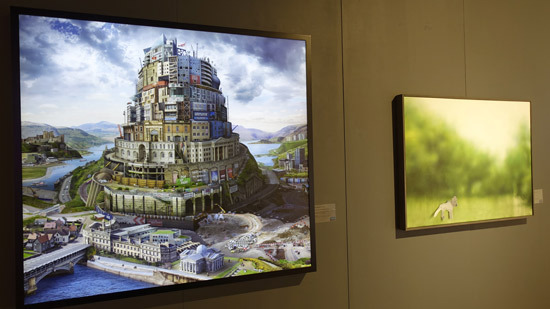 As I predicted, when I saw the Selected Artwork for The Columbia Threadneedle Prize 2018 Emily Allchurch has won a prize! This is MY TIP for A PRIZE - because there is an explicit nod to art history, it's clever and technically much more than proficient, uses contemporary visual art media and provides an intelligent comment on contemporary society. It's a contemporary figurative artwork with a BIG 'C'. 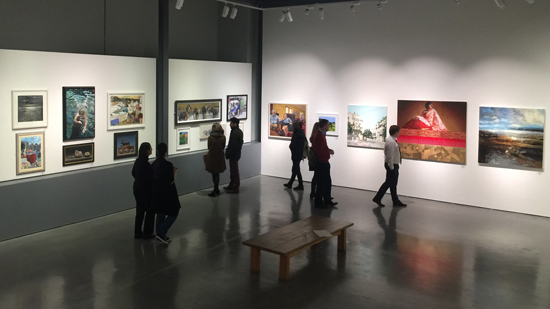 When the Threadneedle Prize Exhibition opened to the public at the Mall Galleries, visitors to the 2018 Exhibition were asked to vote for the artwork they liked the best. After the exhibition closed and all the votes had been counted, it was announced that ‘Babel Britain (after Verhaecht) 2017’ won the £10,000 prize. I actually found it very difficult to photograph it in the exhibition because it looked its best and most natural when you stood right in front of it. I was quite perturbed after I saw what happened to it in this photo! I later found I hadn't had my camera on the best setting for what is essentially a digital photo collage as a transparency on a bespoke LED lightbox. Nevertheless it is an extremely impressive artwork - and hopefully kicks into touch the notion that digital art software cannot produce good art. It certainly lends a whole new meaning to the phrase "art from photos"! My feeling is that visitors both appreciated the huge amount of effort that had gone into producing this artwork - but also its topicality and implied message within contemporary society - particularly in London post Grenfell. 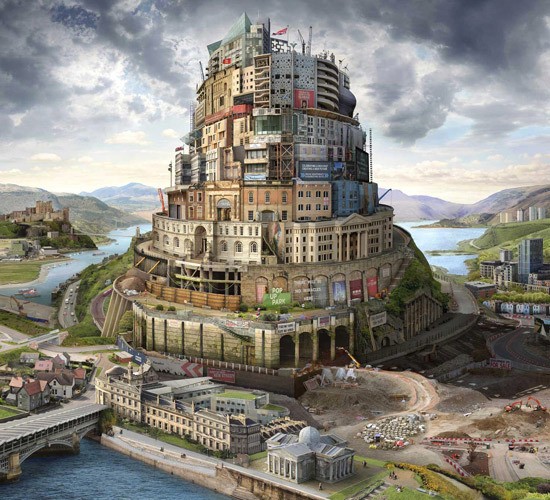 Various artists have painted their own version of the Tower of Babel over the years. 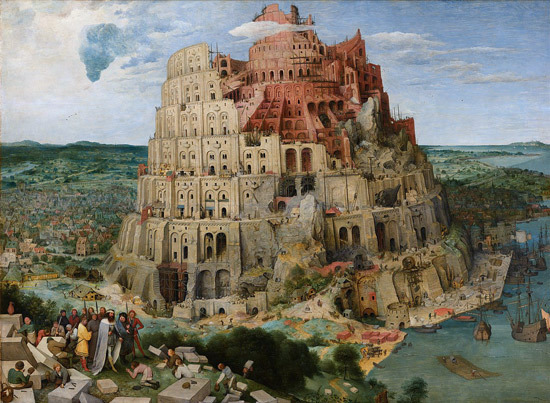 Tobias Verhaecht (1561-1631) was a Flemish artist who painted several versions of the Tower of Babel. Here are just a couple of them. Personally I prefer the version by Pieter Brueghel in Vienna. 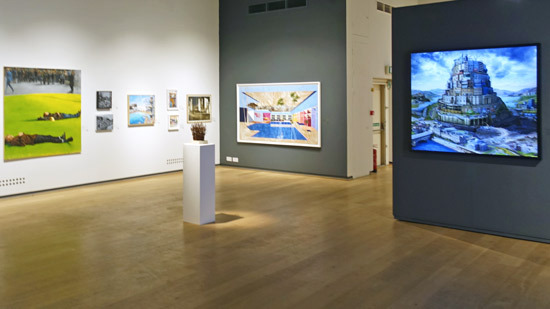 Posts on this blog about the first decade of the Threadneedle Prize. Threadneedle Prize 2012: The Making a Mark Select Six - An alternative shortlist for the Threadneedle Prize 2012. Threadneedle Prize 2012 - the Award Winners - Ben Greener wins Threadneedle Prize 2012. Robert Truscott wins People's Choice Award 2012. Threadneedle - just another art prize in 2010? 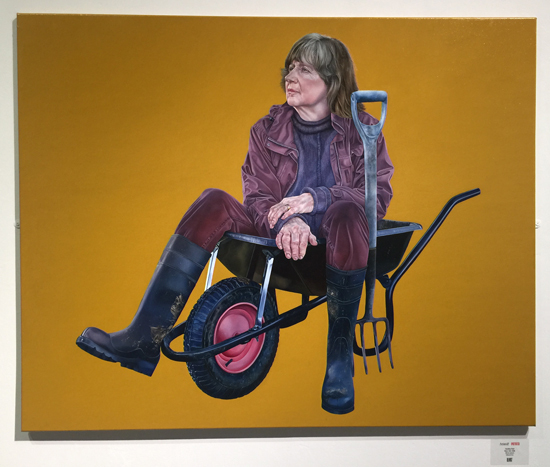 Nina Murdoch wins the Threadneedle Figurative Prize 2008 - which I picked out as the winner at the press preview and was the very first person to cast the "people's vote" for the winner! Posted by Making A Mark on Sunday, February 25, 2018 0 comments Who's linking to this post? 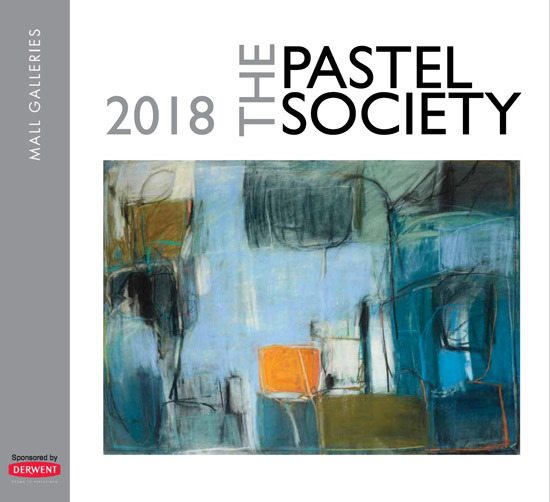 The Pastel Society is holding its 119th Annual Exhibition at the Mall Galleries. view the e-catalogue for the exhibition on Issuu. I'd like to be able to point you at a list of prizewinners on the website - but there is none there. 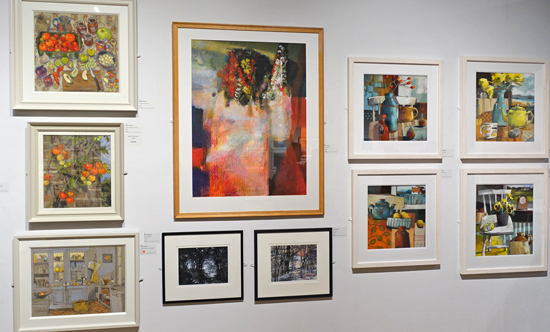 Instead the next best thing is the list of award winners - with good images of the artworks - on the Mall Galleries Facebook Page - which is public. 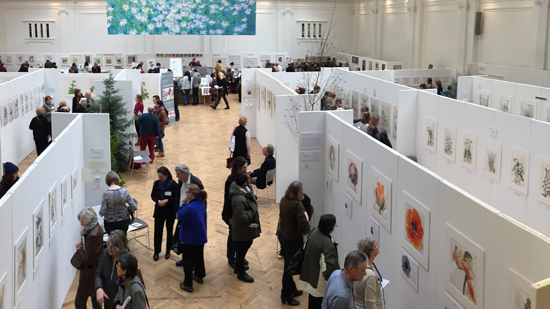 See my earlier post Events, demos and workshops at the 2018 Pastel Society Exhibition for the remaining events during the course of the exhibition - which include two pastel demonstrations in the gallery tomorrow. However note that most workshops are now fully booked. There are 275 works in the exhibition (4 more than 2017). That said the work was hung without the benefit of the Threadneedle Space. So far as the OPEN ENTRY is concerned..
meaning that the majority of exhibiting non-members only have 1 artwork selected. 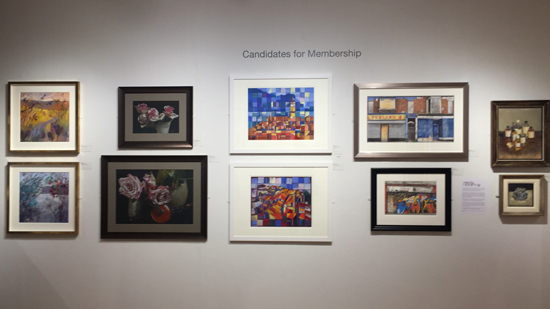 The exhibition again had a wall of works by Candidates for Membership. I think this is a very neat way of making it easy for existing members to review works prior to voting and for non-members to see the calibre of work by people who would like to become members. You can see the two walls below. 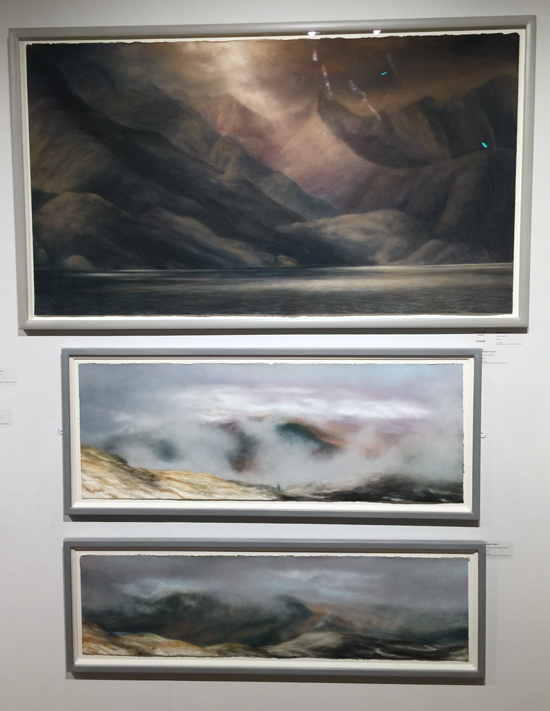 The chap in the middle Martin Goold (above)won the Henri Roche Award with his work called Mountain Town - which is always a prize worth winning as these are EXPENSIVE pastels! I really liked the works on the right hand side by Benjamin Hope which did an excellent job of looking just like oil paintings. I also love the fact he is a son of artist and, as a teenager, rebelled by NOT becoming an artist and instead going to Cambridge University where he did a PhD in Theoretical Nanoscience: The Electronic Structure and Spintronic Potential of Transition Metal Nanowires and Carbon Nanotubes: a Theoretical Investigation. Since becoming an artist, he has been a very consistent exhibitor in the Mall galleries at various shows. Having taken a look at his website and the catalogue of a recent exhibition with a sculptor, I can see him becoming one of those people with multiple memberships of FBA Societies! He's certainly producing some excellent artwork in both oil and pastels. This was my favourite corner of the exhibition - such a pity it wasn't in plain view but was hidden behind one of the blocks which create bays. It's very odd. I was convinced that Norma Stephenson had started using new frames because her work was leaping off the wall and shouting at me from across the gallery. However I went back and looked at my photos from last year and they are the exact same sort of frames. 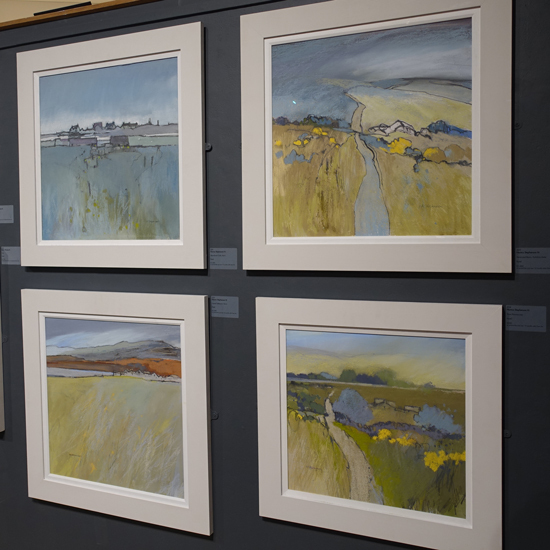 However the works didn't seem to suit the frames whereas these landscapes looked brilliant in them. The artist who most surprised me this year was Libby January - whose work I forgot to photograph properly. I wasn't a big fan of the feature end wall in the Main Gallery. It wasn't that the work was not good - quite the contrary - it just didn't look as if it belonged together. Angela A Court and Jeanette Hayes would have looked much better next to one another - rather than separated by somebody pastel painting Venice - even if he did win a prize! Posted by Making A Mark on Friday, February 23, 2018 0 comments Who's linking to this post? 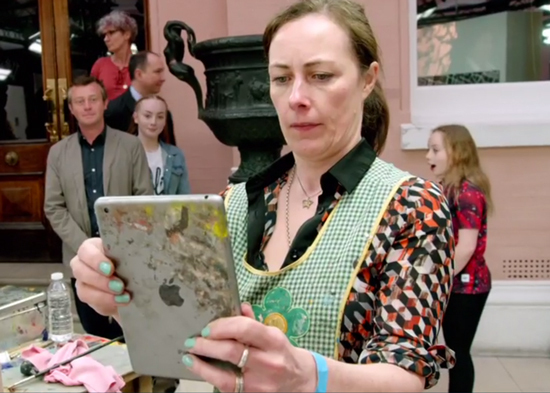 This is a review of Episode 6 of Portrait Artist of the Year by Sky Arts - with added extras about the artists not included in the programme! You can find links to my previous reviews of the first five episodes at the end of this post. Marcus Callum (Facebook | Instagram | Twitter) - Born in Scotland in 1967 and now based in York. Originally a computer programmer, he trained as an artist in New York and Sydney and spent 20 years in Australia before returning to the UK. 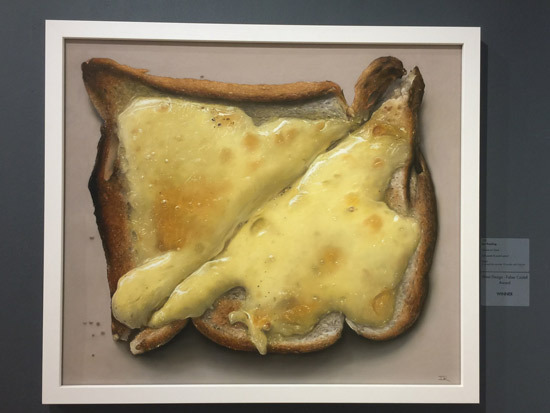 He hads a major interest in classical realism and he's been a former finalist (three times) in the Archibald Prize (something they didn't mention on the programme) and a finalist (three times) in the Art Renewal Center International Salon (again not mentioned). He is now a professional artist working primarily as a painter but also working in digital media. He has a section on his website about the Sky Portrait Artist of the Year competition. It includes some of his four hour practice portraits (obviously painted from photos). Interestingly his self portrait for the competition was also the painting which was an Archibald Finalist in 2012. (The link tells the story of how he painted it). Samantha Fellows with her family right behind her - literally! Jessica Wolfson - Born in Scotland in 1972, she did her degree at the Glasgow School of Art and lives and works Glasgow. She now teaches at the Glasgow School of Art. She won the BP Portrait Travel Award in 2002. I am a Glasgow based visual artist specialising in scribbling ,making mistakes , rubbing out and constantly painting over things . Niki Duffy - This is his self-portrait. b.1988, he did an animation degree at Salford University. He works mostly from photos having used friends as models. This was the first time he had worked from a live sitter. Lyn Aylward (Facebook | Instagram | Twitter) - based in Norfolk, Lyn specialises in portraits and figurative studies worked in oils. She's a member of Artworks and Breckland Artists and exhibits on a regular basis. Miriam Morada (spelling?) - a student from Singapore who is currently studying fine art at Glasgow School of Art. Dave Duffy (Facebook | Instagram | Twitter) - a former graphic designer and self-taught Irish artist born in Wexford who has no website. However his Facebook Page has 10,000 followers. Interestingly he was approached by Sky Arts to enter the programme - which suggests there are people working on behalf of Sky prowling popular Pages and Groups for likely candidates! He was given a short amount of time to create a self-portrait - which he produced in one session of several hours. He's also a session musician and teacher. As usual, there was a lot of variation in the self-portraits in terms of size, media and pose. Clearly some were designed to attract attention while others very much focused on the quality of the painting. If you get the opportunity to review the programmes again, the remarks made during the survey are indicative of the sort of features the judges are looking out for. I'm now pretty convinced that the survey of the self-portraits is pretty critical to who gets through to the shortlist. 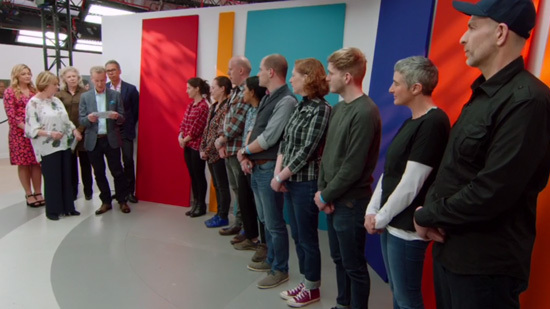 My guess it that after the review of the real portraits as opposed to the digital images, the Judges have pretty much decided which are the artists they need to keep a particularly close eye on. In fact I wouldn't mind betting they have a short list in mind before a brush is lifted! In part, it's a pragmatic solution to the fact that the day is long and they don't really have time to review and debate which self-portraits they really like at the end of the day. They need to have already decided which ones were "good", which were "mediocre" and which disappointed when seen in person. Hence the importance of the submission to both getting selected and,, in my opinion, the shortlisted artists in each Heat. The sitters were all actors - Claire Skinner, Kenneth Cranham, and Sope Dirisu. They were all EXCELLENT sitters - which was I think reflected in the portraits produced by the better painters. Posted by Making A Mark on Wednesday, February 21, 2018 2 comments Who's linking to this post? You can see the 50 artworks shortlisted for the Readers Choice Award on the competition website. 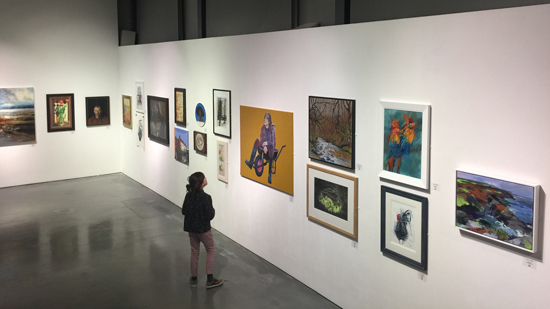 The winner of the Readers Choice Award - and other awards - is being announced at a special prizegiving event this evening (Tuesday 20 February) at the Mall Galleries. 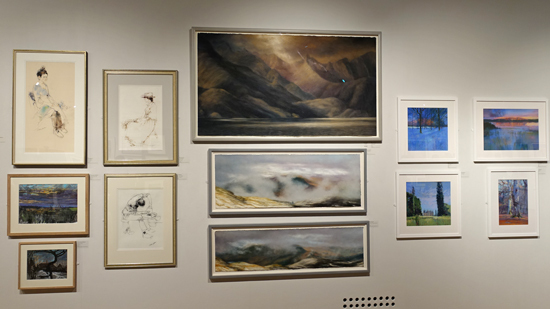 I saw the exhibition yesterday when I visited the Pastel Society's annual show. Interestingly people were confused as to which exhibition they were in - and were wondering if the A&I Exhibition was the Pastel Society. 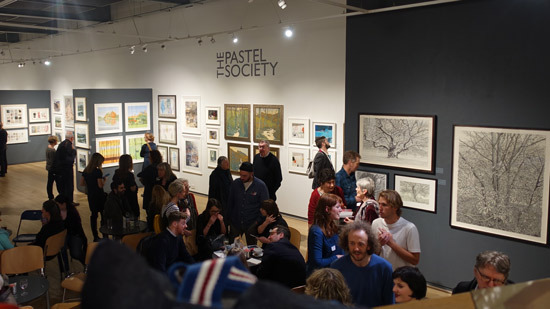 This is maybe unsurprising given that last year the Pastel Society also had the Threadneedle Space for their exhibition. Maybe scope to improve the signposting of the different exhibitions on entrance to the gallery - and individual galleries? 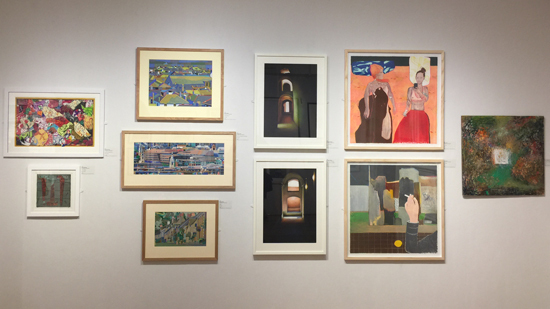 However I have to say I found one very marked difference between the artwork on show compared to that in the Pastel Society exhibition elsewhere in the Mall Galleries. I walked around slowly once - took some photos and then looked again. Something was niggling. I always like to work out what a niggle is all about. I could see that some of the draughtsmanship was good - a bit too good if anything. I suddenly realised that most of not all of the artwork on display failed to show optical mixing of colours on the support. I didn't see transparent glazing in the watercolours. I saw very little paint mixing on the support by those using oils and acrylics. This approach to painting creates images which I find curiously flat. To me it's a technique of painting that is also also very characteristic of an amateur painter. That's because, unless used by expert hands, it can veer towards giving an impression of 'painting by numbers/fill in the contours" effect. The painting that I liked best was by Caroline Pool. I recognised the name straight away. She had two works in the very recent Threadneedle Exhibition 2018 and curiously this work is hung about a couple of feet to the left of where one of her paintings hung in the Threadneedle Space last week! This painting works hard at shapes and form and the differences in textures within the painting. The cutout effect also demanded that my eye take a close look! The palette of colours used was also almost triadic - which again made for a pleasing picture. Posted by Making A Mark on Tuesday, February 20, 2018 4 comments Who's linking to this post? This is about the Call for Entries from international artists for The 4th Derwent Art Prize. 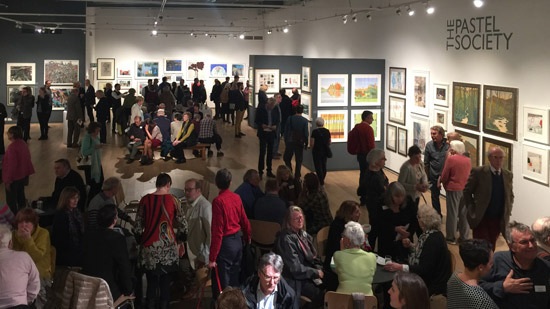 The Prize aims to reward excellence by showcasing the very best 2D & 3D artworks created in created with any pencil or coloured pencil as well as water soluble, pastel, graphite and charcoal by British and International artists. with an overview of the timeline of dates. 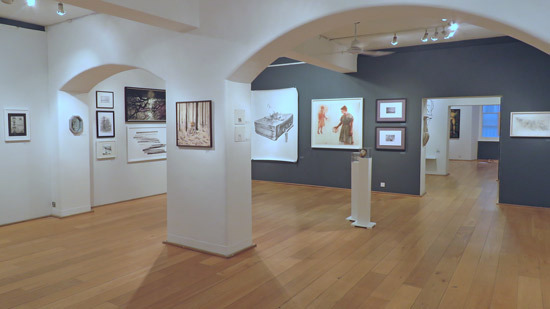 Approximately 80 drawings will be selected for exhibition at the Mall Galleries. The exhibition will be held between from 18th – 23rd September 2018. All artists selected for exhibition will be invited to the Private View and Prize Giving on the evening of Tuesday 18th September 2018. 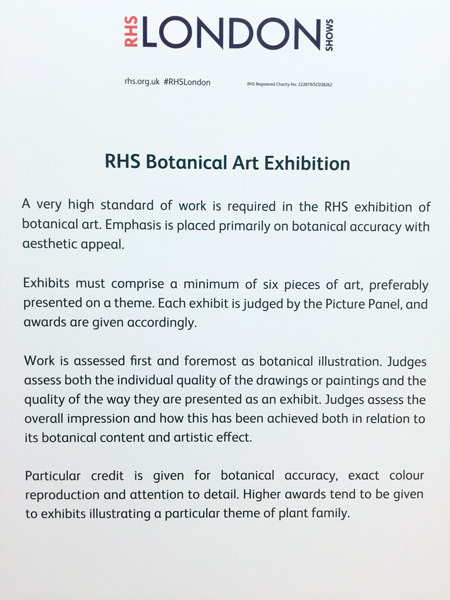 The exhibition will then tour to a number of venues throughout the UK - which means that all work submitted to the competition for exhibition must be available until 31st January 2019. A gallery curator, a leading artist and an art critic comprise the independent selection panel who decided which work gets selected for exhibition and which work gets prizes. I very much hope that this year the organisers actually check that the judges have both read and understand the conditions of entry! (i.e. no making up their own version of entry requirements and terms and conditions!) I don't enjoy highlighting Judges who very clearly breach the rules of the competition. 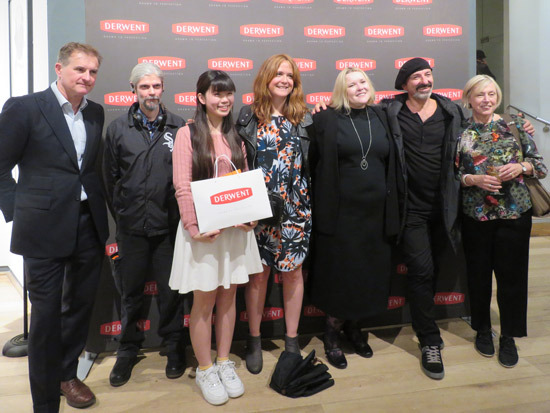 See Derwent Art Prize 2014 - ineligible drawing wins first prize? This is the Facebook Page https://www.facebook.com/DerwentArtPrize - which is never very active. This is the Twitter account @DerwentPencils which is quite active. You can see the Derwent Art Range on the sponsor's website. The competition and exhibition organisers are Parker Harris. Further enquiries about the competition should be addressed to Parker Harris, on: derwent@parkerharris.co.uk or Tel. + 44 (0) 1372 462190 - but do look at the FAQs first! All entrants must be over the age of 18 years old on 1st June 2018. You also have to be alive! Posted by Making A Mark on Monday, February 19, 2018 0 comments Who's linking to this post? This is the first in an occasional series of "long SUNDAY READS". By which I mean, highlighting topics or web pages which involve reading for more than a minute! If you are an artist who has developed your skills in making art and worked out what you want to make art about - you might now be wanting to move on to the next stage. 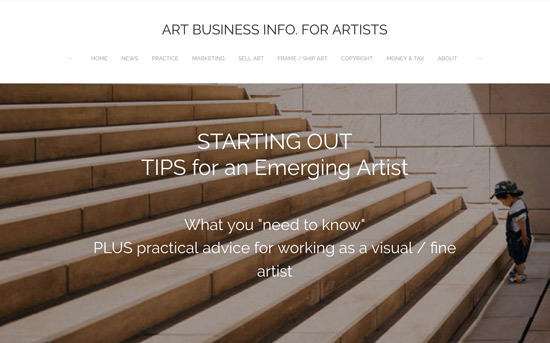 This first SUNDAY READ is all about the attitudes, habits, knowledge and practices related to the art business which will help emerging artists develop their careers - and exhibit and sell their art. Try my LONG SUNDAY READ #1 for tips about "what you need to know" and practical advice about working as a visual artist. It's by no means a finished page. I'm intending this should be a page that I keep adding content to over time - as I develop more of my Art Business Info for Artists website. OR leave a comment on this blog post below. I'm particularly interested in the questions that emerging artists want answered. That will help with the continued development of the page. I already know what quite a few of these are - but am always interested to learn more about what are your BIG issues. Plus you never know I may have already written about the topic! Posted by Making A Mark on Sunday, February 18, 2018 2 comments Who's linking to this post? the second is a detailed guide about using graphite for scientific illustration by Rogério Lupo. 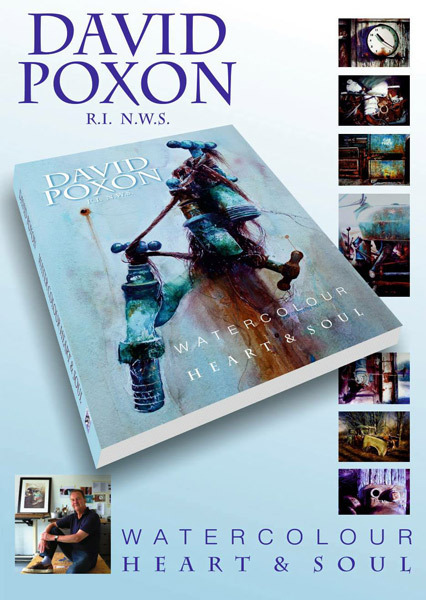 Watercolour, Heart & Soul is David Poxon's first book about how he paints in watercolour. To me that seems somewhat surprising given he's been a leading watercolour painter with an international reputation. Indeed he's moved on to being one of those artists who you see a lot of other artists trying to emulate his paintings! David is an elected member of the prestigious R.I. (The Royal Institute of Painters in Watercolours) and serves on the R.I. Council. He is also a signature member of N.W.S (The National Watercolour Society) in the USA and has served on the jury for selection (in 2015). The book is now published. UPDATE: Please note I am only suggesting this book for people who want to see David's paintings. 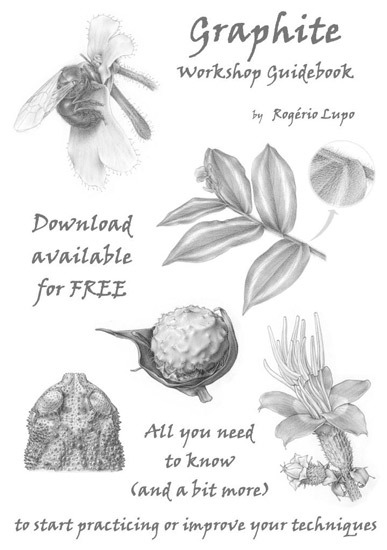 Graphite for Scientific Illustration by Brazilian illustrator Rogério Lupo is a new English translation of his Guide (in Portuguese) about how to use graphite for scientific illustration of botanical subjects. anyone who wants improve their knowledge and skills in the use of graphite for scientific illustration generally and botanical illustration in particular. Practical and fast methods for rendering of hairs and thorns. He also provides a very useful commentary on both brands and grades of graphite and different types of paper suitable for working on when using graphite. Rogério Lupo is a Brazilian Natural Science Illustrator based in Sao Paulo. He has won first prize in several competitions including the very prestigious Margaret Flockton Award - for international 'strictly botanical' illustrators in 2010 and 2013. He graduated in biology from the Universidade de São Paulo. Much of his work is dedicated to the illustration of scientific botanical articles/papers. He has also researched different approaches to illustration and artistic techniques. Judging by the traffic to my blog post yesterday on my Botanical Art and Artists website, there's very great interest in getting hold of this Guide! Hence why I decided to share it with a wider audience. Posted by Making A Mark on Saturday, February 17, 2018 0 comments Who's linking to this post? When creating publicity for an art exhibition - what comes first? The image or the words? Do you recall how The Apprentice programme on BBC always has an episode where the two teams have to make a poster and video advertising a product - and they almost always get it wrong by trying to do too much and just creating visual clutter? Art Exhibition Posters can sometimes remind me of the worst examples perpetrated by The Apprentice! Muddled, cluttered and with virtually no visual impact! What would you have done/said? I would be grateful if you could give me some advice if you have the time please. Myself and 5 other artists are planning an exhibition in a local town. We are very different types of artist with different styles and working in different media. followed by dates, venue etc. The artist who was absent on that day, objects to this as she does not like the listing of the type of artwork which will be exhibited & says she has never seen an exhibition listing 4 methods of work. I’m not sure that “Joe Public’ will understand the subtleties of mixed media when describing a local exhibition but by listing what type of work is being exhibited they will get a better idea of what is being exhibited. This was my response - which basically ignores the thing they don't agree on and tackles the issue they've not addressed. You want to minimise the words and fight over the image you are using to promote the show. If you like have a smaller line down the bottom listing the artists - but don't obscure the image! 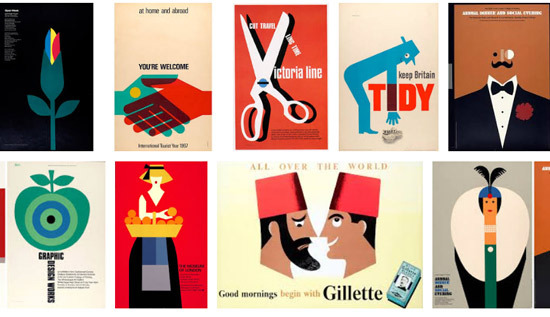 I also sent a link to this Guardian slideshow of posters by Tom Eckersley, who was one of the foremost poster designers and graphic communicators of the last century and also taught design. 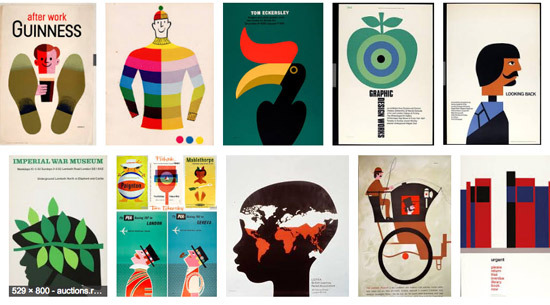 Here's a couple of composite images which give a sense of the ratio of great image to words used by Tom Eckersley. Notice how you can detect clues of what they are about without being able to read the words? That's what a great art exhibition poster / publicity should do too! To which my reply might be - why does it need to be anybody's artwork if you can come up with a great graphic design? Posted by Making A Mark on Friday, February 16, 2018 2 comments Who's linking to this post? 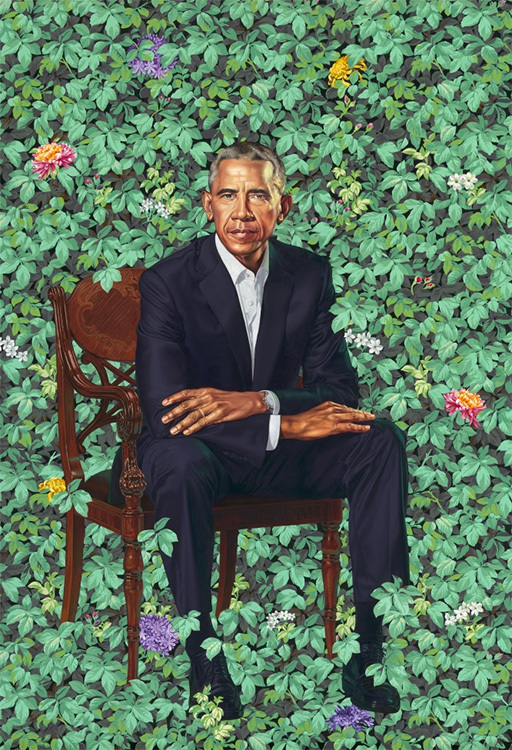 I found the whole unveiling of the Obama portraits by Kehinde Wiley and Amy Sherrald and the subsequent reaction to be quite fascinating. The first official presidential portraits of an African American President and his First Lady by African American artists generated quite a 'response'. It's like everybody is suddenly a portrait expert. It felt a bit as if one could almost do a sociological analysis of America based on how people responded. So I've done a round-up of some of the articles that were published and tried to categorise them. Interspersed by some of the comments made at the ceremony. Start with this one - Presidential portraits: from Washington to Obama – in pictures - which provides a visual record of the portraits of past presidents - to provide some context! Plusthe Unveiling Ceremony - if you care to watch. Speeches towards the end are interesting. Most Presidential Portraits Are Anodyne. Not Obama’s. | New York Times - The artists for the portraits of Barack and Michelle Obama addressed the politics of race in subtly savvy ways in these new commissions, our critic writes. I think the question could be asked the other way round. How come all previous portraits have been so anodyne and just plain boring! What's the meaning behind the portrait? I think one thing people have forgotten to comment on is just how many people are likely to come and view these portraits. I think there will be another batch of articles some way down the line commenting on how many visitors they have generated. Then the interesting question will be is it because of who they are - or because of how they were painted - or because of who painted them or all of those factors bundled up together. I vote for the latter! Former President Barack Obama's portrait is in the America's Presidents gallery on the museum's second floor. 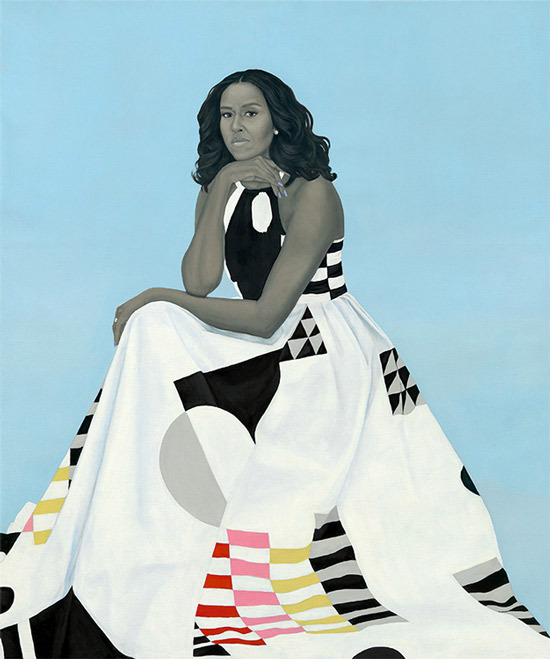 Former First Lady Michelle Obama's portrait is featured in the Recent Acquisitions gallery on the museum's first floor. Posted by Making A Mark on Thursday, February 15, 2018 0 comments Who's linking to this post?